Meet the artists every Saturday between 11-2pm. snacks and hot chocolate. Beautiful and original art created by local talent. There are different artists and creations each weekend. Need extra wall-space and/or table-space? Artists attendance during Splash Art Market is not mandatory both days all day, however, is mandatory on Saturday from 11-2pm when we host the ‘meet and greet’ and a 2 hour shift minimum either day. Stay all day both days if you like.. mingle, get to know other artists, or demo art on site. Artist are responsible for setting up their own station/wall space on Friday and take down on Sunday right after the show ends. Artists who have participated in past Splash Art Market(s) are automatically accepted into the Splash show, however MUST submit the required Splash info: new photos, brushed up bio..etc. There is a minimum of 50% that needs to be new works. 4-5 images of your work intended for sale (in jpeg format) with size, title, and medium (acrylic, glass, metal. etc) to neonmilkshake.me@gmail.com. Which weekend(s) you are hoping to apply for. Participants can apply for all weekends, additional fees will apply. If a submission is successful, a contract and inventory sheet will be issued to applicant. If you are an artist that has an inventory system for multiple items like jewellery , greeting cards etc. please let us know. Wall-space, Easels, and tables will be provided by Neon Milkshake.
. Additional plinths, shelving units and such can be brought in by artists but must be discussed first, as there is a theme (white & wood). Splash Art set-up is at Neon Milkshake Art Studio on the day before the show during the day before on Friday during the day, early evening) and art pick-up is to be picked up at the end day, Sunday at 3:30pm. Artists are expected to hang, display their own work during set-up and take down. Canvases / mounted wall pieces MUST have secure backing, wire, or hooks. How can someone buy art? Art can be purchased by debit, cash or credit card at the Splash Art Market cashier. Who collects monies for work sold? Neon Milkshake will have a cashier for payment of sold items. Artwork sold will be given to artist's minus 20% commission after the month-long sale has finished within 30 days. Yes! Splash Art participants will be responsible for distributing a small stack of invites to show & sale. Please invite your family and friends!! Also, a total of 10,000 invites will be printed for mailbox distribution. There will also be paid/free social media, newsletters, and word of mouth. How many artists are involved in Splash Art Market? (with our Splash Art logo) will be provided to all artists for their artwork, please bring a black pen to fill out the information. Pick up art tags beforehand saves artists time on the day of set up. Tags will include title, artist's name, dimensions, medium, and price. Again, if you are a jewellery artist or card-maker for instance, stickers on bulk items are acceptable as long as I know which product is which on the inventory sheet(s). Artists will be asked to bring in one food item on Saturday, for our artist meet and greet. What kind of art is accepted for submission? 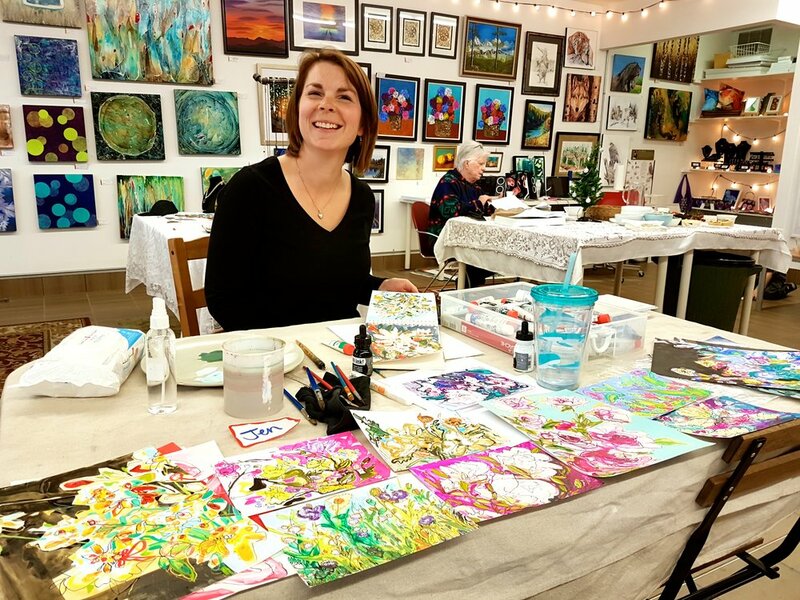 Previous Splash Art Market participants have showcased paintings, drawings, jewelry, sculpture, handmade greeting cards, photography, mixed media, fibre art. Show us what you have! There is a mixture of new and established art-makers in the show. All Rights Reserved (c)2016-2019 Neon Milkshake Inc.